I just finished up upgrading the brakes on my father’s 1980 El Camino. This is a daily driver that I am testing several different master cylinders for a manual brake conversion swap. His brakes worked good before exchanging out all the parts, but I wanted to take out most of the variables when testing master cylinders. First and foremost, I wanted to make sure this 1980 El Camino did not have quick take up front brake calipers. In my research, quick take up calipers will make it difficult do get good pressure to the caliper when using manual brakes. The Speedway Motors big bore metric calipers (2.75” bore v 2.38” bore standard) came with brake pads, but the pads did not have a rating on them. I DID NOT want to use a brake pad that would need a lot of heat to be effective. The weight difference between the two calipers is less than ½ of a pound. This is a daily driver and not an autocross car, so I chose the Bendix Titanium pads because my research and reviews showed them to have good cold clamping friction. Based on the EE rating, the rear shoes should also have good cold stopping abilities. Look on the pads or shoes when you buy them to make sure they have a rating on them. The higher up the alphabet you go the hotter the pads will have to be to work effectively. Pads or shoes with no rating on them should be avoided. 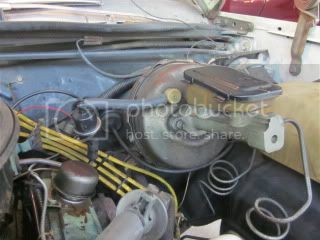 It was surprising to me to find a 24mm strait bore aluminum master cylinder on this 1980 El Camino. I didn’t know they made aluminum ones with a strait bore for g-bodies. I had always been under the impression, because it was aluminum, that this was a step bore master for quick take up calipers. 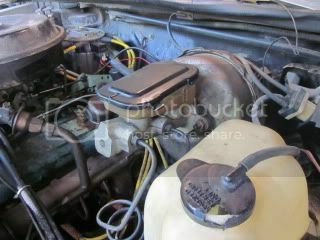 I do know for a fact that any NEW replacement master cylinders for g-bodies will for than likely be cast iron. So if you want aluminum master cylinder for power or manual brakes that bolt up to your brake lines, a rebuilt master cylinder may be your only option. I changed out the 30 year old rubber brake lines with the braided stainless. The front lines were a little longer than the originals, but I routed them so they were not touching any suspension pieces. The rear was a little more difficult to replace because the clip that holds the rubber line to the frame was difficult to get at. The new braided rear line was fairly easy to install also. The hardest part to the entire swap was installing the rear wheel cylinders. Getting the clip off was not too bad, but getting the clip back on was a pain. I did it with two c-clamp, and open ended wrench, and the lid off of an old battery terminal cleaner (don’t ask for these details because I do not recommend doing it this way. G-H-E-T-T-O). After the system install, bleeding the fluids, and bedding in the pads and shoes I took it out for a spin to test the brakes with the same master cylinder and vacuum booster from the original test with the original brakes. Even though I was able to easily lock up all four wheels, it seems to have a little more pedal travel before you could feel the brakes start to grab. I believe this has to do with the increased piston area in the front calipers and rear wheel cylinders while using the strait bore 24mm master cylinder. The 24mm master cylinder will have more pedal travel to fill the extra volume of fluid required by the calipers and wheel cylinders. 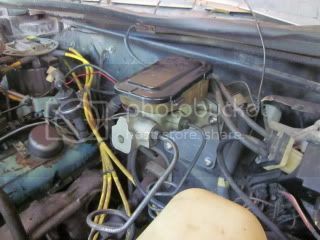 If keeping the vacuum booster, it might be best to step up to the step bore master cylinders that are used on the 1981 and up g-bodies. The primary bore is still 24mm, but it also has a larger step bore of 36mm that will increase the volume of fluid to the larger calipers and wheel cylinders. For the manual brake setup, I am going to test the original strait bore aluminum master cylinder with 24mm bore. Stay tuned for an update within the next month. Last edited by malibudave1978 on Wed Jul 18, 2012 7:24 pm, edited 10 times in total. Rear port is for the front brakes. Front port is for the rear brakes. and of course i put them backwards...... with old straight bore mc didnt really matter... now i got a stepped mc of a monte carlo. How did you have the the lines reversed? They are two different sizes. ripped the entire rusted out brake lines off the car and started with a roll or 3/16, 5/16 line and rusell braided brake lines. I thought the standard bore was 2.38", so wouldn't the 2.50" also affect the brake bias-and peddle travel?, and the 2.75" even more? Or did some later year G-bodys use the larger 2.50" calipers? Did not know the s-10 step up bore size was 31.5, that may be the direction I'll go also. I thought stock was 2.50", but since you measured them, stock is 2.38"
The manual brake conversion went well when using the manual brake hole that is already predrilled in the factory vacuum booster power brake pedal. I kept the stock , 31 year old, 24mm master cylinder that came with the stock power boosted brake system. I kept the 24mm master, for now, because I upsized the front calipers and wheels cylinders. It stopped the car ok, but I felt I still had too much pedal travel and I couldn't get the front brakes to lock up. I am going to rebleed the calipers, unbolted from the spindle, to point the bleeder screws up at the 12 o'clock position. If this doesn't do the trick, I will bolt on a brand new manual brake master cylinder from a 1978 to 1980ish g-body. This master cylinder has a smaller bore which should give me higher pressure at the pad. Last edited by malibudave1978 on Wed Jan 04, 2012 9:14 pm, edited 6 times in total. Well it looks like 2.50" will be an tiny upgrade for me if I go with stock style calipers, I mic'd my original ones and the caliper piston does come out to 2.38", o.d. If you do go with the s-10 master cylinder, I'm curious to see how that works out. I stand corrected. I was under the impression that it was 2.50". I rebled the front calipers unbolted from the spindle to try and get rid of some of the spongyness in the pedal. I did this to see if there was any more air in the system at the caliper by rotating the bleeder screw at the 12 o'clock position and bleeding the system. No air at the caliper, so I think the origanal 31 year old master cylinder has air in it or it is bad. 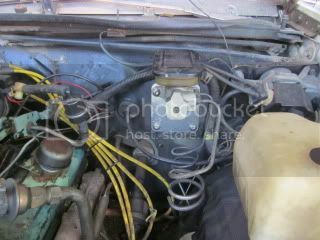 I am going to replace it with a new 7/8" bore master cylinder from a manual brake 1978 g-body ($60 from amazon). Though it is made of cast iron, it is the smallest bore master cylinder that readily bolts on. I know of no aluminum master cylinders that are 7/8" bore that will readily bolt on, other than one of the expensive aftermarket ones. 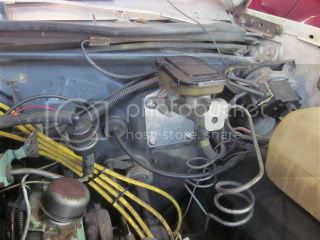 I would also like to test a master cylinder from a Dodge Dakota. It has a 24mm bore, is aluminum, and with one brake fitting adapter, it bolts into place with the adapter plate I am using. Can you elaborate on how you made the rod to go from the pedal to the master? I'm in the process of doing this swap and want to make a secure rod. I have one of your adapter plates btw. 78 Malibu Wagon, Grandma Special 68K miles, Pump Gas 383 on the hit. 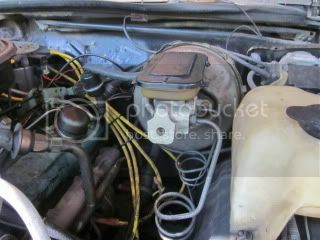 78 Malibu Coupe, E98 fed 406, RHS heads, TH350, 9inch. 86 Monte Carlo Ls, Alochol fed 383, TRZ Suspension, Powerglide. 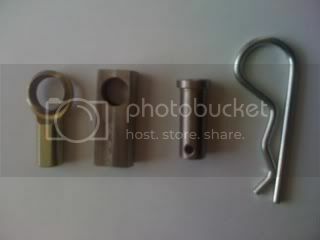 I am not a machinist but this is the parts I initially used below and how I put together my linkage. I have since upgraded the rod end to a custom rod end designed my me. I designed my own because I wanted something that would not have the potential to fail and have a better fit on the pin (stud) with no slop. ATTENTION/NOTE: I used high quality industrial type material above for the rod end and the steel pin (stud). The stud and the rod end I bought online. The Home Depot/Lowes stuff is very low quality and SHOULD NOT be used. These are your brakes used for stopping your vehicle. Failure of these braking components will cause loss of your braking system and could cause injury or death. Do this modificatin at your own risk. IMPORTANT: Make sure you have something to retain the brake pushrod to the master cylinder. If you don't, this will cause a total loss of brakes. Make sure you retain the brake pedal pushrod to the brake pedal. If you don't, this will cause a total loss of brakes. I mocked up everything on the bench by removing my brake pedal assembly from underneath the dash of the car. I used a press to install the 1.25" long 1/2" diameter pin (stud) into the top manual brake hole on the brake pedal making sure that the hole for the retention pin was not inline with the power brake pin (stud) below it. This is a press fit and the pin will not move once installed. I next modified the 5/16-24 spherical rod end. I used a press and pressed out the spherical ball. The hole will be a little larger than the 1/2" pin (stud) after you press out the spherical ball, but it will work. I then test fit the rod end on the 1/2" pin (stud) that I pressed onto the brake pedal making sure it slid over it without too much slop. I next bolted up the aluminum manual brake adapter plate to the brake pedal assembly on the bench starting with the two lower holes first. If you have a gasket, DO NOT use the gasket during this proceedure. Next bolt your master cylinder to the aluminum manual brake adapter plate and brake pedal assembly. Now we have to modify the length of the 5/16-24 grade bolt and also make it into a brake pedal pushrod. Screw the 5/16-24 grade 8 nut onto the 5/16-24 grade 8 bolt to where is ALMOST bottoms out on the bolt (do not tighten at the bottom, back it off of the bottom of the threads of the bolt so it is free to turn). Now screw the 5/16-24 grade 8 bolt onto the modified 5/16-24 rod end until it bottoms out (back it off slightly so it is loose and free to turn). Install onto the brake pedal pin (stud). Install the brake pedal switch into the brake pedal and screw it in only enough so it doesn't fall out (this will give you maximum brake pedal travel). Give the brake pedal switch a small tug to verify that it is securely threaded enough to hold. With the brake pedal against the brake light switch, swing the 5/16-24 grade 8 bolt up toward and against the bottom of the master cylinder. With a permanent marker, mark the bolt where it needs to be cut. NOTE: If you are using a master cylinder with a deep pushrod retention hole, measure the depth of this hole and add it to the mark you placed on the 5/16-24 grade 8 bolt. Once you determined the length you need, remove the pushrod assembly off the pedal and cut the bolt where you marked it. Once cut, reinstall onto pedal and test fit. If it is still to long, remove and trim a small portion off the end and refit. Once the correct length is found, round off the end ( I used an abrasive disc). Install the pushrod assembly back on the pedal, and adjust your pushrod out to where it barely touches the master cylinder piston. Retention Pin - a little overkill, but it is easy to remove and install. The modified spherical rod end I drilled out to 5/8" and installed a bronze bushing on the pin (stud) to take up the slop in the pedal. It worked, but it required spacers/washers also to keep the rod end from moving sideways on the pin (stud). The custom steel clevis I designed takes out the slop and the side to side play. Oh my...the devils in the details. I'll be setting mine up shortly. After reading all this...All I can say is WOW. malibudave1978...are you a rocket scientist?..I mean that in a good way.